The choice of communists and dictators worldwide, the AK47 and AK74 are simultaneously lauded, hated or just overlooked, but almost never are they suppressed in the West. Until now, that is. I’ve just returned from a trip to the Dead Air Armament Utah headquarters where I visited with Komandir Mike Pappas and Comrade Gary Hughes. I shot with several of their final prototype Wolverine AK suppressors. Dead Air is different, and while I knew that already, I was about to find out a lot more. Dead Air pakhan Mike Pappas and patsani Gary Hughes wanted to build a suppressor that would work on virtually any AK47 or AK74, not just some high end ultra refined version. They like their rifles raw and built 100 of them in a broad variety of configurations. Not only did this make them Kalashnikov avtoritet who know the AK platform intimately, they had a broad enough variety of test guns to make sure the Wolverine AK suppressor would work effectively regardless of whether the owner routinely eats Borscht or burgers. To get an idea as to why the Dead Air Wolverine AK suppressor is such a big deal you first have to look at why you rarely see pictures of suppressed AK47 or AK74 rifles. The quality of guns varies enormously from maker to maker, and even within products from a single source. Their manufacturing tolerances might be compared to those for Russian nesting dolls – they work, but they might be pretty loose or bespredel. The first big hurdle you face in designing a silencer for the AK platform is bore concentricity, possibly compounded by barrel or front sight base threads that are not perpendicular. Translated, the bore of the barrel needs to line up with the hole in the suppressor so your bullet doesn’t strike your suppressor internals. Slapping a silencer on your AK used to be tantamount to your suppressor playing Russian roulette with itself. One solution is to make sure barrels and threads are done precisely at the factory. This is something the better gun makers can do – third world military factories run by baklany, not so much… These high end suppressor ready AK rifles can be purchased for a premium, but you still have the expense of the silencer to add to it. More significantly, it leaves every other AK owner out in the Siberian cold, something contrary to Dead Air’s priorities. The other big hurdle is this: Like communist leaders of yesterday and today, Kalashnikovs are notoriously over gassed. They leak gas and noise out of various places, making traditional silencer designs ill suited for the platform. With the Wolverine silencer, Dead Air solved both issues. Any Wolverine purchaser can quickly ascertain that the bore on suppressor is a big funnel. Basically, it starts out as a .30 caliber can, but ends in a .45 caliber exit hole. This minimizes back pressure and mitigates the baffle strike issue. Through extensive testing and analysis, Dead Air fine tuned the Wolverine suppressor to get the right blast chamber volume and baffle stack design and spacing. The final result is a silencer that looks and sounds great. Looks is a subjective statement. I think it looks great on the AK, though not so much on a svelte AR-15. Sound is more objective. Does the Wolverine suppressor make an AK47 or AK74 hearing safe? That depends on the gun, the ambient temperature, the ammunition, etc. Some of Dead Air’s testing got results that were hearing safe. In other cases, they were just over that threshold. Either way, my shooting showed it to be a drastic improvement. Dead Air isn’t cutting any corners on compatibility. The Wolverine uses a collar system to lock on to various threads and sight pins. 14mm LH (threaded barrels), 24mm, 26mm, 22mm. Essentially, you’ll have a direct thread mount to match your AK’s configuration. In cases where the rifle uses a locking a muzzle device, the collar will interface with that. VZ owners will be happy to know the Dead Air Wolverine is just as at home on their rifles using a 14mm RH thread (same as perhaps half of the Century Arms clones). The Wolverine is already in production and will be available late summer 2016, which is just around the corner! It will be priced similarly to the Sandman S, which I found online for $845. Playing with several captive Wolverines at the Dead Air HQ in Utah was a blast. I’ll look forward seeing them na svobodye, in the wild, mounted to your favorite communist block guns. Special thanks to SHWAT™ Pro Staffer and Kalashnikov addict John Howard for lending his expertise on this story! 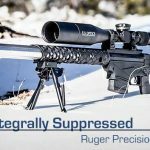 This entry was posted in Special Hunting Weapons & Tactics™ - The Center of Gravity for Tactical and Long Range Hunting and tagged Dead Air Armament, Review, Silencer, Silencers, Suppressor, suppressors by Jonathan Owen. Bookmark the permalink.